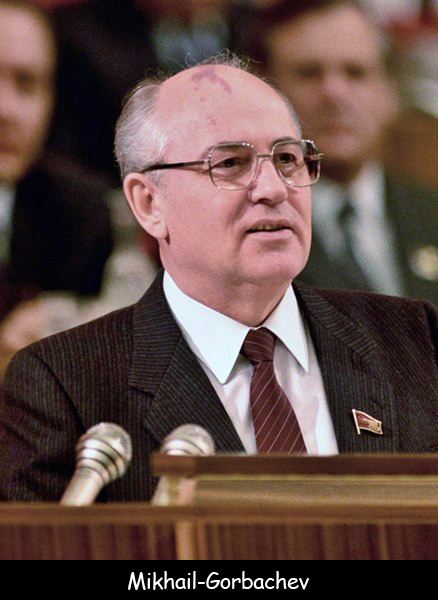 Mikhail Gorbachev was the first president of the Soviet Union. He served from 1990 to 1991. After resigning in 1991, he founded the Gorbachev Foundation. Since then he remained active in social and political causes. Gorbachev also served as the General Secretary of the Communist Party of the Soviet Union from 1985 to 1991. He was the last leader of the Soviet Union. He was born on March 2, 1931 in Privolnoye, Soviet Union. He attended Moscow State University, Faculty of Law in 1955 and Stavropol Agricultural Institute, Faculty of Economy in 1967. Mikhail Gorbachev is best known for his contribution in bringing the Cold War between the east and west after the fall of Berlin wall to a peaceful end. In 1955, he became the first secretary of the communist party of the Stavropol Komsomol City Committee. He was awarded the Noble Peace Prize in 1990 and a Grammy Award in 2004 with Bill Clinton and Sophia Loren. He was mentored by Yuri Andropov and Mikhail Suslov in his rise to national power. Gorbachev brought many reforms to the Soviet Union including new freedoms that led to many countries breaking away from the Union. In 1989, he set up elections in which members of the Communist Party competed against non-party members. In 1995, he began touring factories in Russia, spoke to university students, and denounced President Yeltsin. His biography named as Memoirs was released in 1997 in the United States. Declan, Tobin. " All Facts for Kids about Mikhail Gorbachev ." Easy Science for Kids, Apr 2019. Web. 18 Apr 2019. < https://easyscienceforkids.com/mikhail-gorbachev/ >.